This 20-minute lesson presents upgraded versions of the two NWP models used as High Resolution Window (HiresW), the Weather Research and Forecasting-Advanced Research WRF (WRF-ARW) and the Non-Hydrostatic Multiscale Model on the B-grid (NMMB). Domains include the CONtinental US (CONUS), Alaska, Hawaii, Guam, and Puerto Rico. The CONUS runs of the NMMB and WRF-ARW became part of a new High Resolution Ensemble Forecast (HREF) system in 2015, the first of its kind produced at the National Centers for Environmental Prediction. To familiarize the operational forecaster with the HREF, products from a surrogate ensemble system (the Storm Scale Ensemble of Opportunity from NCEP's Storm Prediction Center) with a similar configuration are used in a 2014 severe weather case study from upstate New York. It was another very difficult one to pass..it took me 4 tries on this one too..normally 2nd to 3rd attempt and i pass.. The questions were often too ambiguous, there were more possibilities to answer a question based on wording. Information in module was helpful, however Quiz questions barely referenced material contained therein. Describe when and how to use the HiresW in the forecast process. 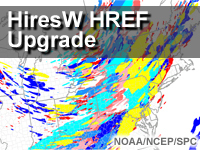 Describe when and how to use the HREF in the forecast process.